This is a post in my "Vacation Eats" series. I'm posting about various eating and drinking experiences I had on our 2011 Vacation Extravaganza -- Pittsburgh, Boston, Italy, Paris, Pittsburgh. A link to all posts so far is available here. The idea is to lose all the pounds I gained by the time I'm finished with this posting series! This is under-photographed, but coffee means only one thing in Italy: espresso. You can add milk to it, but the base is always espresso. And you'd best not add milk if it's after 10 a.m.! Pictured above is a typical Italian bar, with people there in the morning getting coffee. But note there is also a full wall displaying hard liquor. We were walking around the area and eventually went back to this bar for coffee (the picture below). While we were in there, this woman walked in. Looked to be mid-40s, fairly well dressed, seemed perfectly normal, possibly on her way to work. She ordered a shot of vodka, pounded it, paid her tab, and left. Crazy! We cracked up. Guess it was going to be a tough day at the office! Appalling our neighbor's family, one night in Lecce, hubby was hungry. For the most part, they seem to usually skip dinner. But with our expanded stomachs, I was also ready for more food. I really just wanted a crepe, but I agreed to go with him for pizza. Our neighbors and their family continued their evening stroll while we ate. And yeah, I decided to go ahead and get my own pizza -- which I proceeded to eat in full! Mine (on the right) was called Pugliese -- basically just onions. Tasty! Aside from fruit (and cake) at our neighbors' sister's house, when we ate dessert out in the city, we only ate at one place. There is a gelateria widely considered to be the best, and we went there several times while we were in Lecce. I thought the Kinder cereal flavored gelato was unusual! Also, here are a few pictures from La Pasquetta, Easter Monday. In Lecce, they have a large festival in the city. While most Italians usually spend la Pasquetta in the country, there are enough people in the city that many cities organize celebrations. In Lecce, there were tons of bands playing in the center of town. Lots of fun to listen. As we were going to visit our neighbors in Lecce, and they know all about my dietary preferences and restrictions, there was a special meal waiting for us when we arrived on Easter Monday, la Pasquetta, all made especially for me! The meal started with this huge serving of eggplant. Yes, I ate it all... Another one of my favorite foods of the trip. I failed to photograph most of my secondo plate (and don't know how to rotate pictures). It included these things that resembled cheese sticks, and that fresh mozzarella seen in the background, olives, fresh ricotta and bread. Dessert was fruit, pictured above, and a big bowl of strawberries, and whipped cream. We also had these cream-filled Easter cakes, and dessert wine. Easter is a big holiday in Italy, and on la Pasquetta, Easter Monday, lots of people go with their friends to the countryside for a picnic. We drove that morning to Puglia, Italy's boot "heel." And they had a big "Pasquetta in Citta'" festival going on. But the point of this is that even at the gas stations, Easter is a big thing. We finally broke down and bought our first Padre Pio magnet to bring home for our refridgerator (hubby's family's house (and friends' homes) is filled with Padre Pio stuff. We might as well get our collection underway. We already have a little wooden thing, but our fridge was void of Padre Pio until we stopped at this gas station. Free with purchase of our Padre Pio magnet was an Easter cake. Too funny! Oh, and I photographed a new variety of Pringles that I saw at the gas station. I don't know why I take pictures of Pringles cans in foreign countries, but let's just say, 2011 is not the first year I've done this. You really find some unusual flavors abroad. Now that I've celebrated Easter in Italy, I better understand why they don't have a feast day that is the equivalent to Thanksgiving -- in terms of quantities of food consumed, the holidays of Thanksgiving here and Easter there are probably comparable. We ate so much on Easter I seriously spent the second half of the day feeling like I was on the verge of vomiting. Way too much food. But it was all so good, and looking back now, I wish I'd eaten just one more of the peach desserts.... Sigh. We'll have to go back one year. Above, church in Nicastro, Easter morning. The chocolate egg with a surprise inside. This photo fails to capture how big it was. Before Easter lunch, we went to hubby's cousin's house, and she served this chocolate liquoer. It was thick and a nice way to start the meal. Her dad (behind her with the cane) also had a glass. Lots of things on the stove before lunch! This better shows the scale of the egg. Texas flag trivet! Hubby's cousin from Belgium checking the pasta. Homemade pasta, probably one of my fave foods from the trip. This was some kind of meat-stuffed fried eggplant. Again, note the Texas trivet -- that was a gift from us years ago. Another fave food. These were some kind of stuffed crepes. I think most of them had meat in them, but at least a few were solely cheese, just for me. My first course -- the crepes. I should have taken a picture of my clean plate afterward! This was some kind of pork with red sauce. I didn't eat it but hubby said it was good. The pork and another kind of meat as secondo, plus the peas. I count peas as one of my favorite foods in the world. These peas were probably the best peas I've ever eaten. Fresh, delicious, insanely good. Hubby's secondo plate. After he'd eaten a plate of the pork with the red sauce. Lots of eating on Easter. My secondo plate. This shows about 1/8 of the cheese I ate. And about 1/3 of the peas. I went back for more several times! This is a Calabrese drink. It's coffee in mineral water and hubby's cousin's son loves this stuff. I tried it once a few years ago and didn't really like it. Didn't have any on this trip. A chocolate Colomba, a typical Easter dessert in Italy. Another fave food of the trip. These were called "peaches" but they were a cream-filled dessert, made by hubby's cousin. Again, insanely delicious! 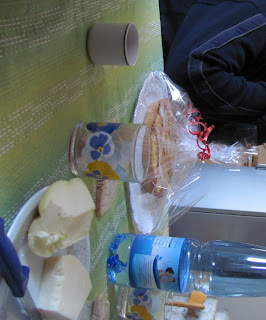 And some kind of ricotta torte for dessert, homemade and very good. The three main Easter desserts. And spilled wine on the tablecloth. My almost-empty dessert napkin. Don't worry, I also finished the last bite of that rictotta torte. And coffee. Hubby's cousin's son with the chocolate egg on Easter night. Hubby got to do the honors of breaking it, and we all ate some. When we left Lamezia, of course we were loaded down with food for the rest of our travels and I got a big bag with pieces of this chocolate egg. I'm not a huge chocolate eater, but this was really, really good. We usually eat the same thing for breakfast at his family's house. Some kind of bread, marmelade for me, Nutella for hubby, and coffee (Italian coffee, which means espresso). Sometimes there are some biscotti and cereal too. Kind of a boring meal. Not exactly an easy place to fly to from Dallas. My choices were basically to leave at 7 a.m. and arrive at 3, to leave at 8 and arrive at noon, or to leave at 6:30 or 7 at night and arrive around midnight. Ugh. But since I'll be getting there around noon, I think I'm going to take the rental car and drive to Idaho. It's one of the few remaining US states that I've never visited! Looks like it's only a couple hours away. I'm not wild about traveling for work. It didn't bother me too much before I got married, but now I get lonely. And I also tend to eat too much crap on the road. I miss having my go-to foods, my trainer, my running trail, etc. The good news is that it looks like there are some great places to run in Missoula, and the weather will be maybe rainy, but at least not hot and humid. I'm going to make a go at a 1-mile run that has 620 feet of incline, up to something called the M on Mount Sentinel. One night in Lamezia we went to our friends' house for dinner, and one of hubby's cousins joined us since he's also friends with them. Our friends have two litle boys and she is pregnant now with a little girl, who will be born in late July probably. The boys are both overweight, which I think is getting more common among Italian kids; they're both completely adorable. The younger one (named after my husband) is described by his mother as a tsunami, but the older one is pretty well-behaved. For a boy. Of about 7 years of age! Anyway, she cooked dinner for us, which was great! To start, we had a type of bruschetta, suppli (rice balls), and then something like a pig in a blanket and some kind of salami, both of which I pushed onto hubby's plate and I loaded up on the rice balls! Then we had pasta with red sauce and peppers. 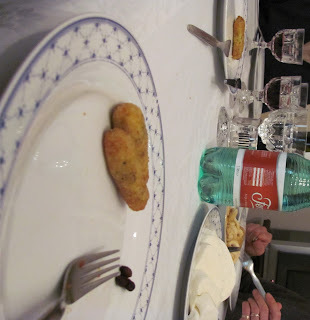 My secondo was potatoes with peppers, fresh mozzarella, olives, and a pepper mix. And fruit cocktail for dessert! ﻿It was a lovely night with them, as always, lots of good food, so much great companionship. While we were in Lamezia, we ate lunch at hubby's family's home (where we stayed) most days. I was tempted to make this several separate posts so you'll get a complete picture of how much each meal was and not think the pictures include many meals, but that would take too long. Just realize that each meal was TONS of food. I failed to take pictures of at least one lunch at home, but these are good representative samples of what it's like to eat there. Lunch is definitely the big meal of the day. The kids come home from school and the guys come home from work, and everyone eats together. Dinner is small, unorganized, and not usually anything special. I'll add a typical dinner at home to this post too, just for reference. Pasta with greens, made especially for me, the vegetarian! Homemade sundried tomatoes, home-grown olives (with pits) and wine (homemade by someone they buy from). Sundried tomatoes and bread for my secondo. And oh yeah, don't forget the cheese... Lots of delicious cheese. Fruit for dessert. And they're big on peeling all fruit with a knife before you eat it. A few homemade biscotti with espresso after lunch. First, a plate of penne with red sauce. Sooooo good. Then greens mixed with beans for me, fresh tomatoes (which hubby loved) and a plate of various meats. Hubby's plate. Not sure what the meat was. He loved the tomatoes and olives. And then the bowl of fruit for dessert. Sorry not to know how to rotate the pic. More cheese, and a sweet dessert in the background. Of course coffee after lunch. Zia getting ready to cut the torte. Mmm, the torte was delicious, made with fresh ricotta. All that for a single lunch! And this is what we ate for dinner on Good Friday, after we got back from the procession through town and stations of the cross service. Other dinners are posted separately (the pizza restaurant, and dinner at friends' house), but those are definitely atypical and just b/c we're visiting. Above is a much better example of daily eats at least for the lunches. Easter lunch gets its own post!